This sign is for Perfect Circle Piston Rings and Expanders. The sign’s colors are yellow, blue, tan and white. 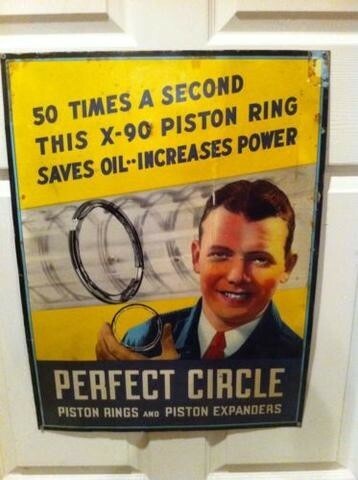 The text on the sign reads: 50 times a second this x-90 piston ring saves oil increases power Perfect Circle piston rings. The sign shows a man holding a piston ring with text above and below.